The chapter is dedicated to co-design as a WIS development methodology. 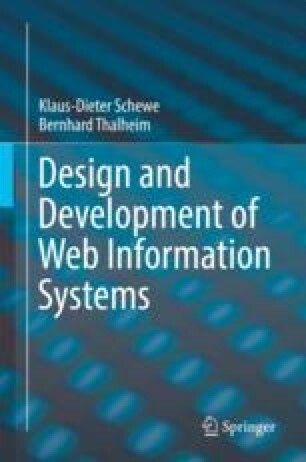 The chapter starts from general principles of co-design originating from research in areas such as data-intensive information systems, service-oriented systems, and distributed systems. In data-intensive systems the local-as-view approach is common for the development requiring the handling of static and dynamic integrity constraints, workflows and view towers. In service-oriented systems co-design stresses task-centration, which adds the decisive aspect of user demand that is very important for WIS. The dual global-as-view approach that is common for the development of distributed, data-intensive systems is further discussed, by means of which aspects of collaboration enter the general picture. Then all these aspects are merged in an integrated co-design approach for WIS, by means of which all the technical content of the previous chapters is merged into a general methodology for WIS development.